The fate of Photoshop was sealed when Adobe, encouraged by its art director Russell Brown, decided to buy a license to distribute an enhanced version of Photoshop. The deal was finalized in April 1989, and version 1.0 started shipping early in 1990. That first version of Photoshop was written primarily in Pascal for the Apple Macintosh, with some machine language for the underlying Motorola 68000 microprocessor where execution efficiency was important. It wasn’t the effort of a huge team. Thomas said, “For version 1, I was the only engineer, and for version 2, we had two engineers.” While Thomas worked on the base application program, John wrote many of the image-processing plug-ins. Top DL: Pre-installed English copy of version 1.0 - Registered to Apple Computer France. My thanks to MacTouch for locating and adding it to our archives. 2nd DL: Pre-installed copy of version 1.0.7 - This is registered to the Ref & Pres Library, Apple Computer, Inc. (see screenshots 1 & 2 above). 3rd DL: Same as the first DL above but repackaged as top DL did not want to play in Mini vMac (SSW 6.0.8 & earlier). 4th DL: Floppy disk images; Imaged from original disks on a Power Macintosh 6100/60, Disk Copy 4.2, System 7.1.2, Stuffed with DropStuff 5.1.2, Tag data present. Serial included as text file. 6th DL: Additional floppy image (missing from 3rd DL) containing Photoshop version 1.0 filters. Disk Copy 4.2 image file with Tag data present, in StuffIt ".sit" archive; "3rd_Party_Software.image_.sit". Contains a set of six filters, all created by and ©1990 by John Knoll. 7th & 8th DLs: 400+ page "User Guide" and 128 page "Tutorial" for Photoshop 1.0.x of manuals scanned to PDF, in StuffIt 5.5 compatible .sit archives (manuals were sourced from The Computer History Museum). 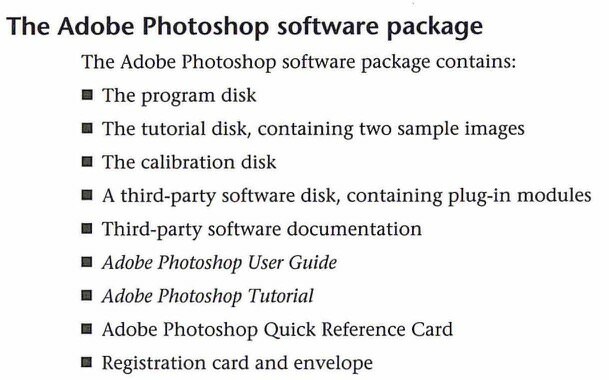 9th to 11th DLs: Remaining documentation that was included in with retail Photoshop 1.0.7 packaging, scanned to PDF. Location of it's Prefs file determines where Photoshop 1.0 sets its virtual memory Scratch Disk. i.e. ; If you have additional hard drives and choose one for the Prefs location, that will become the location of Photoshop 1's Scratch Disk. In order for Photoshop 1.0 to recognize additional 3rd party filters, the Photoshop Prefs file must reside in its Plug-Ins folder. By saving the Prefs file inside of the Plug-Ins folder, 3rd party plug-ins then become available in the menus. Also, the info button "About Plug-Ins...", located on the "About Photoshop" splash-screen (see screenshots), becomes active and you can get some additional info about those plug-ins. I had a freeze using Photoshop 1.0 on Macintosh SE and System 7.0 / 7.1 when opening the "color" picker. The error code was 29, i.e. dsNoPackErr 17 + Color Picker 12 (this is an error code "overflow"). It turns out that if a user installs System 7 for Macintosh SE "only" (as opposed to all Macintosh installation type), the resource PACK #12 is not installed in the System suitcase. @melomac: Thank you for the updater to version 1.1, - I ran it on a System 6 install and it updated version 1.0.7 to 1.1 OK.
Might you have the Third-party software documentation or the Quick Reference Card? If you have either, would it be possible to scan them? If it's too much of a hassle, no worries. Thanks again for uploading the plugins disk. Even it's nearly the same, any chance for uploading the 1.0.7 plugins disk anyway? Thanks, plug-ins for Photoshop version 1 are rare. By two more do you mean the two C-Cube Microsystems compression/decompression plug-ins for 020 or higher Macs? These appear to create compressed tiff's using JPEG compression. Proprietary by the looks as nothing else seems to be able to open the lossy files they create (unless these plug-ins are being used). there's a 4th disk that should've been included with the 1.0.7 package. "A third-party software disk, containing plug-in modules". The disk set for Photoshop 1.0.8 LE has a plug-ins disk. I don't know if it is the same as what would have been included with the 1.0.7 set, but I can confirm that they are compatible, they're from the same year (1990) and are on an 800k floppy image. I would be good to get the original tho' and compare. If that 4th disk could be uploaded like the other 3 in the "Photoshop_1.0.7_CLEAN.sit" archive, that'd be amazing! @miku2007: I don't think it would be possible to thank you enough for the upload of the original Disk Copy 4.2 images. Amazing. Thank you. Image in the second DL mounted without issue in Mini vMac. Much appreciated, 24bit. Thanks. Same here LeoET. I added a second DL made from the original in 8.6 with DiskCopy. Attempting to mount the image in Mini vMac, SSW 6.0.8, reports that the disk needs to be unlocked, cannot write to the desktop? "Huh, cool, except it crashes OS9." I was able to run it in System 7.5 on a Performa 6300 and on Mac OS 9 running in Tiger's classic layer on a G5 tower. I don't know how stable it is over time, but I did try a few things before quitting and it was fine. Huh, cool, except it crashes OS9. Why am I not surprised? The same year this version of Photoshop was released (1990), the hottest, most powerful Mac on the planet, was the IIfx (if you could afford it) running System 6.0.x. PPC Mac was still a few years off, and Mac OS 7.0 not quite ready for prime time. Photoshop vers. 5 to 7 runs fine on Mac OS 9x. Versions 3 & 4 also run OK, but 5.5 and beyond are Appearance Manager aware (optimized to run on 8.0 or later). Photoshop 1.0.7 will happily run on a Mini vMac or Mac Plus in one bit mono. Its output can print as full 24 bit color from that vMac or Plus. No mean feat. This is a great little painting app. Wish they'd had layers back in those days, but still a fun relic that is compatible with quite a few image formats still used today! This site is in French, but the downloaded file is in English then. Klick on the little 'Télécharger' (in green letters) and get the .sit-file. This app works in a 'Classic' environment with 'Tiger' 11 and is tested with Systems 7.5, 8.6 and 9.1 as well.